One of the important goals of public education is to inculcate us with the values, myths and visions of our country. After all, a nation is composed of a group of people with a common set of values, goals, history and visions living within a defined territorial boundary and presided over by a government or leader. If the nation is to continue to exist from one generation to the next, the young must be taught what to believe. In America, as in other countries, public education has been determined the best way to achieve this. While there are many who attend private schools, the curricula required in those schools is dictated by the state. All students, whether in public or private schools, are taught the basics that lead them to becoming loyal and proud Americans. It is this belief system that is the very fabric of America. The divergent opinions within that belief system creates the texture of our uniquely American fabric. While those diverse views have sometimes stretched the fabric to its limits, it has torn it only once, resulting in the Civil War. Since the end of that war we have seen many changes in America and the world around us. The events of the latter half of the 20th century thrust America into world leadership both militarily and economically. As we assumed those roles we changed internally as well. Economic leadership required a larger and more educated workforce. We became a more urban society as many moved off of the farm and into the cities. But most importantly, the expansion and availability of information first on TV and later on the internet began to make us more aware of ourselves as a nation. It served almost as a mirror, and many didn’t like the reflection. It created the birth of a social awareness that had up to this point been marginalized in our culture. The Civil Rights Movement, the Anti-War Movement, the Women’s Lib Movement, the Gay rights Movement became forces in American culture. Of course, for every “movement” there was a “countermovement”. The fabric was being stretched and the texture, while once exhilarating and exciting in its diversity, was now becoming belligerent and threatening. As we view the first years of this century the picture has changed little. There are a multitude of issues on which there is great disagreement. There is enormous stress on the fabric that we call America. We look at Congress and say that it is dysfunctional. It can’t seem to come to agreement on anything. However, as we cast aspersions at Congress are we casting a blind eye at the real problem? The famous quote ” I have seen the enemy and it is us”, couldn’t be more appropriate. Is Congress’s dysfunction simply a reflection of America’s dysfunction? Are our Congressman and Senators not reflecting the opinions of the majority of those whom they represent? Poll after poll shows that America is split almost down the middle on the very issues that are reflective of our basic values and beliefs. Everything from the role of religion in society to equal rights for minorities and gays and the role of government in protecting those in need, as well as interpretations of constitutional rights, are at issue. These disagreements are important because they reflect a fundamental dispute over the values that comprise the fabric of our nation. Now we come to the difficult question. Does America still fulfill the definition of nationhood? What is it that makes us a nation? If we have such vast differences of opinion on the basic values on which our governance is based, what ties us together? 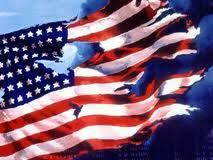 The only time in recent years that I felt that we truly stood together as a nation was when we were attacked on 9/11. Is that what we are, a military and economic entity? Aren’t we supposed to have a common vision, a national dream? Have the differences become so embedded and hardened that we can never reconcile and compromise? I believe these are the important questions of our time. I believe that if our children and grandchildren are to have the benefits that America is capable of bestowing on its citizens and the world, these questions need to be answered. Who are we and what do we believe?